A retired army officer came to me and he was diagnosed as having tumours in the liver and needed chemotherapy. He had two sons, a software engineer in Australia and another a banker in London. One of his sons brought him to me. I explained everything and planned chemotherapy which he wanted to take in Delhi. The son wanted to talk to me alone and sent his father out. He then asked me, “Should I isolate my father to protect my son who is fond of his grandfather and wants to play with him. When I suggested this to my father, he was not very happy and so also my mother.” I stared with disbelief that such an educated, well placed person should be asking such an ignorant question. Let me tell you categorically that cancer is not contagious. As explained in my earlier blogs, it is just the body’s own cells going abnormal and going out of control. It would be criminal for the family to deny the patient love and affection needed most at that time. I was firm on explaining to the son that he can go back to Australia and leave his mother and father together to cope up and share and support each other. In fact, cancer is possibly safer than other disease like multi drug resistant TB and many others that have limited treatment. There are only specific diseases like Hepatitis B & C which can be transmitted to others in the family and produce viral infections to the liver which may lead to cancer. Millions of healthcare professionals across the world involved in cancer care would be a population with high risk and nothing happens to them. This is one of the biggest myths and please be assured that cancer is not contagious. 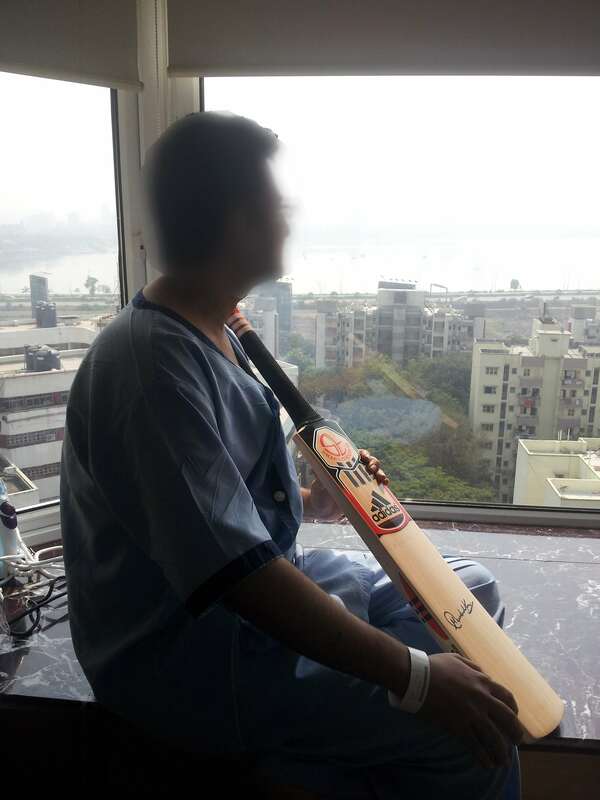 I have never seen a young man who is so positive in his outlook and say ‘I will hit the word ‘C’ from my life with this precious bat autographed by Sachin Tendulkar”. Ashish has been a role model for many young men. He has especially asked me to write to dispel the myth and notion that Chemotherapy is painful and difficult. He is a smiling young man who has gone through radiotherapy, surgery and again chemotherapy and even now remains absolutely positive. In fact, during our campaign on ‘Salute Sachin’, Ashish single handedly could mobilize nearly ten lakhs for children with cancer. He is a ‘true Hero’. It is not about mobilization of funds, it is about outlook towards therapy. Chemotherapy, as the name indicates, is using drugs for killing cancer cells. The single important characteristic that differentiates cancer cell from normal cell is that cancer cell divides at a higher rate than normal cell. Most of these drugs target these cells taht are dividing faster. Unfortunately, these agents are not very specific. That means they are going to attack all those cells which divide rapidly in the body. That’s the reason that any growing tissue eg. hair which constantly grows get affected and one of the disturbing side effects of chemotherapy is hair loss. It is also a misnomer that chemotherapy is one single drug for therapy. In chemotherapy there are multiple different drugs, nearly 100 of them, given in combinations. Some of them may have hair loss as a predominant side effect and some of them don’t. . What is surprising is hair loss is also temporary and those patients who lose their hair, their hair regrows thick, stunning and curly hair giving a new and much younger look. Chemotherapy also affects the cells of the bone marrow that are also constantly dividing and that is the reason that why patients on chemotherapy have lower blood counts and are slightly more prone for infections. But it is certainly not necessary unless the blood counts are really low for them to be isolated in any form. Yes, there are some precautions to be taken, like general hygiene as far as the eating habits and clean water is concerned. Apart from this there are really no major alterations in life style. Children and adults need not go around with masks as is commonly photographed. I always encourage my patients to be as normal as possible. Ashish was working for 6-8 hours even during therapy. Many take their treatment and go to work. I think, being occupied is the best antidote for all the side effects of chemotherapy. In fact, one of my patients was smiling as we started therapy and I said to her “Most of the people are apprehensive and why do you seem to be happy about it?” She said, “Doc, I am convinced that this is going to help me and all the side effects are going to vanish”. It is all in the mind that if you think of the side effects, you are likely to have side effects. Modern medication is excellent for reducing nausea which is one of the distressing side effects and loss of taste. These side effects are very temporary. Please DON’T listen to unsolicited advice from ’well wishers’ who will tell you horror stories. Don’t believe them. Millions have benefited and so will you. There is nothing to be worried about chemotherapy. So, be active, be normal even during therapy and that is the best way to beat the big ‘C’.